Today we continue our Words From Our Founders series examining America’s Founding Fathers’ words on religion, religious liberty, and morality. As Thanksgiving approaches, we are featuring various proclamations of prayer and thanksgiving issued by America’s founders. Below is a proclamation issued by Thomas Jefferson on November 11, 1779, when he was governor of Virginia. Whereas the Honourable the General Congress, impressed with a grateful sense of the goodness of Almighty God, in blessing the greater part of this extensive continent with plentiful harvests, crowning our arms with repeated successes, conducting us hitherto safely through the perils with which we have been encompassed and manifesting in multiplied instances his divine care of these infant states, hath thought proper by their act of the 20th day of October last, to recommend to the several states that Thursday the 9th of December next be appointed a day of publick and solemn thanksgiving and prayer, which act is in these words, to wit. 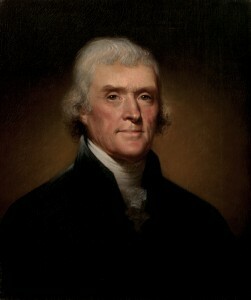 Resolved, that it be recommended to the several states to appoint THURSDAY the 9th of December next, to be a day of publick and solemn THANKSGIVING to Almighty God, for his mercies, and of PRAYER, for the continuance of his favour and protection to these United States; to beseech him that he would be graciously pleased to influence our publick Councils, and bless them with wisdom from on high, with unanimity, firmness and success; that he would go forth with our hosts and crown our arms with victory; that he would grant to his church, the plentiful effusions of divine grace, and pour out his holy spirit on all Ministers of the gospel; that he would bless and prosper the means of education, and spread the light of christian knowledge through the remotest corners of the earth; that he would smile upon the labours of his people, and cause the earth to bring forth her fruits in abundance, that we may with gratitude and gladness enjoy them; that he would take into his holy protection, our illustrious ally, give him victory over his enemies, and render him finally great, as the father of his people, and the protector of the rights of mankind; that he would graciously be pleased to turn the hearts of our enemies, and to dispence the blessings of peace to contending nations. I do therefore by authority from the General Assembly issue this my proclamation, hereby appointing Thursday the 9th day of December next, a day of publick and solemn thanksgiving and prayer to Almighty God, earnestly recommending to all the good people of this commonwealth, to set apart the said day for those purposes, and to the several Ministers of religion to meet their respective societies thereon, to assist them in their prayers, edify them with their discourses, and generally to perform the sacred duties of their function, proper for the occasion. Given under my hand and the seal of the commonwealth, at Williamsburg, this 11th day of November, in the year of our Lord, 1779, and in the fourth of the commonwealth.